A glittering restaurant in the heart of South Beach, Lobster Bar Sea Grille showcases world-class seafood, prime steaks, and unparalleled service in a vibrant, up-scale setting. Born and raised in San Juan, Puerto Rico, Executive Chef Arturo Paz came to the United States at the age of 17 after being accepted at Cornell to study architecture. However, finding winter in New York unbearable, Paz transferred to Tulane University in New Orleans, a move that would propel him into some of the most respected kitchens in the country. Add canola oil to a pan and bring to medium-high heat. Sweat ginger, shallots, coriander seeds, and Thai chilis in canola oil, until softened. Add tomato paste. Lightly caramelize for five minutes. Add reduced lobster stock and bring to a simmer. Add Sriracha and simmer for another 20 minutes. Remove sauce from heat. Add cilantro, lime juice, and lime zest. Cover with plastic wrap and infuse for 20 minutes. Strain the sauce through a chinois to remove any solids. In a large pan, bring sauce to a mild simmer, over medium-low heat. (It is very important that the sauce never comes to a boil.) Add lobster meat and poach for six to eight minutes, turning periodically. Lobster should reach an internal temperature of 140 to 145 degrees, when done. In another pan, add sesame oil and bring to a high heat. When the oil is extremely hot, add the shishito peppers. Cook until the outside begins to char and blister, turning to get all sides. Remove the peppers from oil. Let the excess oil soak into a napkin. 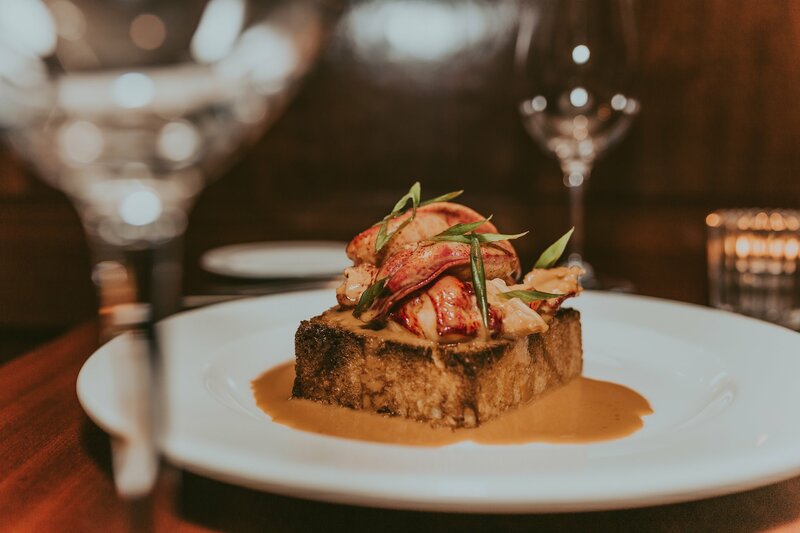 Place the lobster on top of a slice of brioche. Spoon sauce over it. Place your blistered shishito peppers next to the lobster. Garnish with scallions.